PureousTM Concrete Cleaner is a revolutionary new product that works by use of PureousTM powered technology that cleans on the molecular level. Unlike other cleaning products it attacks the source of the dirt without the use of harsh or toxic chemicals. 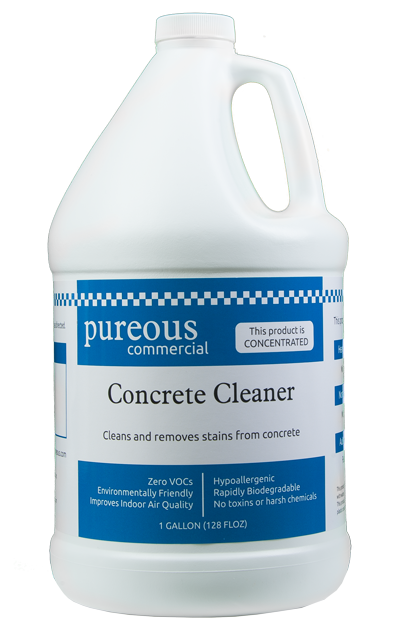 By using PureousTM Concrete Cleaner your concrete will be cleaned of hydrocarbons, fuel spills, and stains. Most concrete cleaning products not only use harsh chemicals that can be toxic to your health, but they also use soaps and detergents that can attract dirt and make your concrete worse over time. PureousTM Concrete Cleaner uses a revolutionary technology to safely and powerfully clean and remediate oil spills and stains from parking lots, garages, driveways, and other hard surfaces without exposing people or the environment to toxins or harsh chemicals.